This middle-grade novella takes us back to San Francisco's Chinatown in the 1950's. Eight-year old Artie is the youngest amongst all of his cousins, and unfortunately, prone to frequent bullying by his elder cousins, especially thorn-in-his-side Petey. Goaded into bragging about his prowess with fireworks, Artie tells his extended family that he'll gift them all with fireworks for the Chinese New Year. Seeing that he's taken on an impossible task, Artie's doting, yet ne'er-do-well Uncle Chester decides to step-in and help out. But, will even his help be enough to close the gap and get Artie the firecrackers he's saving up for? It's a uniquely Chinese-American story, and Yep handles the balancing act between cultures perfectly. There's even a subplot about a possible girlfriend for Uncle Chester. The characters experience several improbably lucky turns, as well as a few setbacks, but everything wraps up very neatly. While some of the racism of those times is implied, it is not overtly part of the story. The slight 112 pages are padded by a lengthy apologist introduction by Yep, explaining that while fireworks are a central part of the story and they were legal in the 1950's, they certainly aren't (in most states, anyway) considered safe for children to handle nowadays. The story is appended with an explanation of some Chinese customs, including information about the Chinese zodiac. 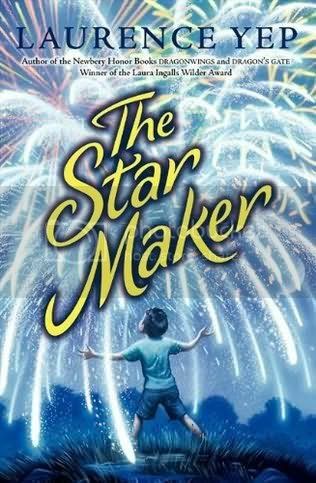 Readers who enjoy The Star Maker will probably also like Being Teddy Roosevelt by Claudia Mills, featuring another plucky, can-do protagonist. I'll put this in the hands of second and third graders who are looking for something a little meatier than Magic Treehouse or Junie B. Jones, but aren't quite ready for a lengthier chapter book yet. Thanks Christy! There's nothing I like better than putting more books on people's TBR lists.